Absolute Hearts: Disneyland gets trademark for the Kenyan phrase "Hakuna Matata"
Disneyland gets trademark for the Kenyan phrase "Hakuna Matata"
Disneyland has been granted a US trademark over the famous Kenyan phrase 'Hakuna Matata' under the registration number 27006605 for use on clothing. 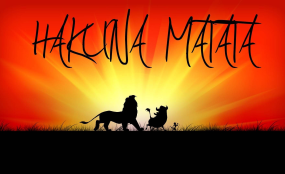 'Hakuna Matata' is a Kiswahili phrase which loosely translates to 'no problem' or 'no worries'. Records from the United States Patent and Trademark Office (USPTO) indicate that The Walt Disney Company legally owns the popular Swahili phrase 'Hakuna Matata'. The trademark means the phrase cannot be used by any other organization or on merchandise by any other company unless with prior approval from Disney. The 'Hakuna Matata' phrase was popularized in 1982 by a Kenyan band Them Mushrooms in their popular song Jambo Bwana.